"I always leave with fresh ideas to use in the classroom. I feel it's almost like a retreat before taking on the challenges of a new school year." 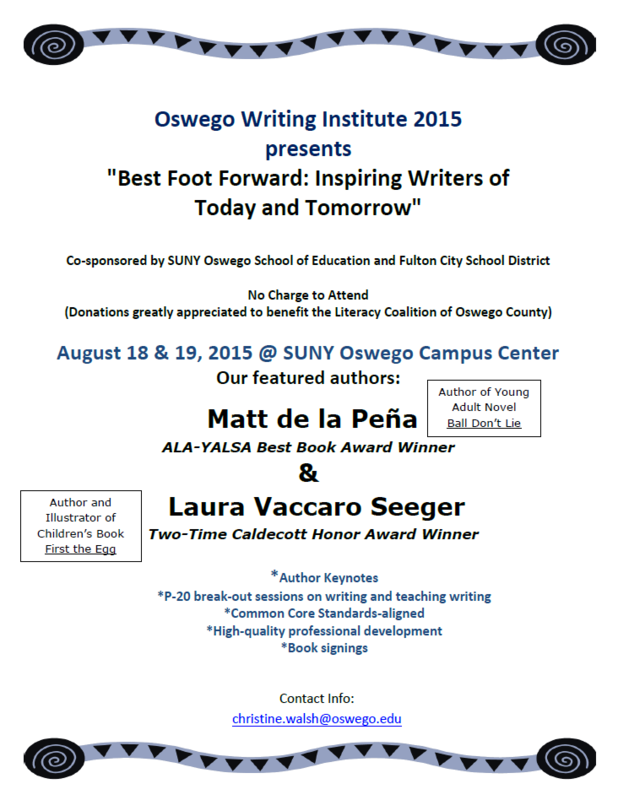 The Oswego Writing Institute is a vibrant community of readers and writers who believe in the impact of teachers as writers and the power of words to create change; who continue to explore what writing is, the authentic purposes writing serves, the natural connections between reading and writing, and effective writing curriculum, instruction, and assessment at all levels for all learners. Participants will engage in and dialogue about the writing process with award-winning authors, other professional writers, college faculty, and teacher leaders who model and share best practices in teaching writing. Participants will apply their growing knowledge of themselves as writers to their own teaching of writing, including writing curriculum, instruction, and assessment at all levels (p-16). "The institute has reaffirmed many of the strategies I started reluctantly putting into practice last year. I feel I have a better sense of how to approach research strategies and writing and more of a drive to find time for my own writing." "I intend to bring the passion for writing that I saw shared here to my classroom. I also learned some practical, hands-on ideas that I will use - conferencing with my students, using mentor texts, using standard-based rubrics, etc." Each year we recognize one or two individuals in the Oswego and/or surrounding Community who has demonstrated a strong commitment to literacy and authentic literacy teaching and learning.